In our last article we talked about Computer aided design (CAD) and how we here at CAP Fixtures use it to assist our clients in visualizing projects in design and development to reduce prototyping costs and lead times. You can read that article HERE. 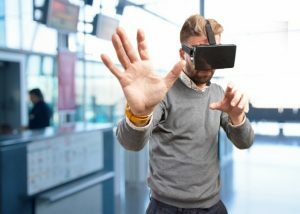 Sophisticated computer-aided design (CAD) gives us realistic images but Augmented Reality (AR) and Virtual Reality (VR) take it a step further. By integrating the CAD images with the real world, users can see how the imagined CAD items interact in the real world. Ever striving to be on the bleeding edge of innovation – CAP Fixtures has invested heavily in CAD and is indeed taking it one step further, delving into the world of Virtual Reality (VR) to put our engineering and design capabilities on steroids. Here’s how we do it, and how it can help you, our valued client, save valuable time and money. Let’s start with what exactly VR is. It was the summer of 2016 when it wasn’t hard to find people swarming parks and wandering in streets looking for those cute pocket monsters called Pokémon. They were using the new technology created by Niantic for iOS and Android devices called Augmented Reality (AR) and this was, for all intents and purposes, many folks’ first experience with augmented reality. If you’ve ever played the hugely popular mobile video game Pokémon GO, you know its simply (not really that simply, actually) a technology that overlays computer graphics onto a screen that feeds the live camera in your mobile device – termed “Augmented Reality,” or AR. Now take that idea, and instead of overlaying one CAD drawing over your live camera feed, overlay it onto another CAD drawing. NOW you are experiencing a completely new– and totally fabricated – reality, completely created by CAD drawings. You are experiencing VIRTUAL reality. This is the powerful technology that CAP Fixtures has adopted for design, engineering and prototyping. So when Dave Baird, VP of Engineering Services over at CAP Fixtures learned of the growing number of manufacturing applications this new technology offered, he immediately began to find ways to apply it to the design and engineering of client projects. How is CAP using VR? Prototyping is expensive. And it gets more expensive when you go through the time and cost of prototyping a new idea only to find that in reality it doesn’t fit or work exactly as you anticipated – and you need to go “back to the drawing board” a few times to get it just right. By using VR, we are able to reduce the risk and costs associated with re-development and accelerate implementation by allowing our designers, engineers and clients to EXPERIENCE the prototype in its planned environment. In the initial stages of the design process, we can create a VR presentation that will give clients a realistic since of scale, color, ergonomics, and visual appeal before one piece of material is cut. 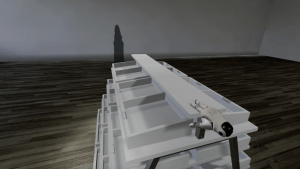 Using VR, users can actually interact with the prototype – physically open cabinets and drawers, walk around it – MOVE it, and in doing so, quickly identify problems. Will this credenza door be obstructed by this wire rack? Will this eyeline be obstructed by this header sign? The term virtual reality has come to mean the ability to “walk around” 3D models and view them as they actually will physically exist. “I can provide the ability to open drawers, doors, etc to get an idea of accessibility and usability. The user can also pick up a fixture and move it to a new location to get an idea of layout and aisleway access.” notes Dave Baird – VP of Engineering Services at CAP Fixtures. And its not just the cost of materials and labor that is saved. As importantly (and in some cases MORE importantly) it’s the TIME. “Virtual Reality expedites the process about 2 months, eliminates the costs involved in creation & freight of prototypes, and gives our clients the opportunity to get that initial batch into their first few stores for testing or for a full rollout. If they only had a $200,000 budget for the first few stores, some of that money would have been used up just creating and shipping the prototypes.” Says Randy Griffith – VP of Sales at CAP Fixtures. Always at the forefront of innovation, the engineers and designers at CAP Fixtures have once again taken it a step further with this new technology – saving our clients time and money and always exceeding expectations. Learn more about this new VR technology and how we can use it for your next project. give us a call at (614) 863-3363. We know you won’t want to EVER do prototyping the old way again.